Dr. K.V. Kasiviswanathan, Dr. M.G. Pujar, Shri. Jalaldeen, Dr. V.S. Srinivasan, Dr. B.P.C. 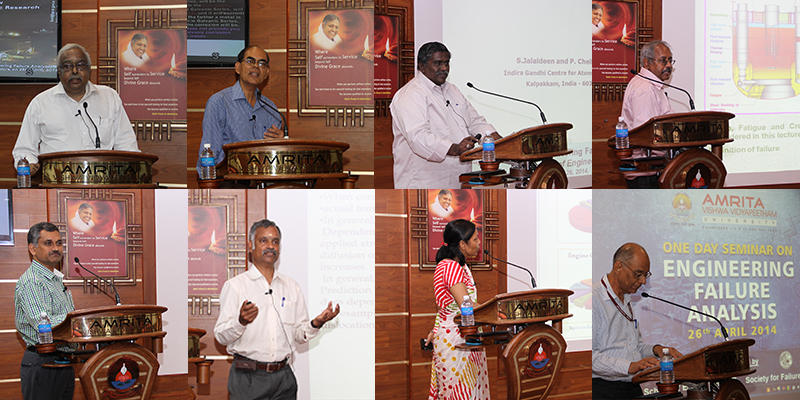 Rao and Dr. P. Parameswaran of IGCAR, along with, Ms. Swati Biswas of Gas Turbine Research Establishment (GTRE), Bangalore, were making presentations in a one-day seminar organized by Amrita School of Engineering, Amrita University and the Society for Failure Analysis, Hyderabad, at the CIR Seminar Hall, Ettimadai. The high profile seminar gave an insight into the modes of failure manifest as cracking, corrosion, creep, fatigue, incipient melting, wear, deformation as well as the Non-Destructive Testing methods available now to detect impending failure. He said that failure prevention is a continuous process. Projects of failure analysis could identify problems in many core industries and lead to solutions. The cause of failure in Reboiler Heat Exchanger of a fertilizer plant, for instance, was crevice corrosion between a tube and tube sheet leading to the Heat Exchanger. The study recommended tubes inside the tube sheet to be expanded to the designed length. In an Aero-Engine Turbine Blade, similarly, the cause of failure was found to be over temperature exposure due to faulty temperature indicator. The recommendation was improved protective coating. He presented many other case studies in the core sector. Dr. Kasiviswanathan added that in failure analysis, along with tribology, deformation of solids, fracture science, corrosion science, mechanics, stress, design criteria, NDE, mechanical testing, metallography, phase transformation and alloy theory experience and intuition also counted. Dr. S. Jalaldeen, IGCAR, spoke on design methodologies against failures. Citing an example of PFBR Reactor Assemblies he said that deformation, plastic instability, creep, fatigue, ratcheting and buckling, vibration and fretting could happen in low temperature and elevated temperature areas. Dr. M.G. Pujar made slide presentation on Corrosion Prevention and control. Corrosion is the deterioration of materials/ components due to interaction with the environment. Corrosion occurs in various forms in different materials depending upon conditions of environment – rusting of iron, pitting and cracking in stainless steel, patina over copper and brass surfaces, degradation of wood and plastic wall thinning in metallic pipes etc. Prevention and control measures against corrosion in different situations were presented in detail by Dr. Pujar. Dr. B.P. C. Rao, Head, Non-Destructive Evaluation (NDE) division, Metallurgy and Materials group, IGCAR, made an engaging presentation on NDE and early detection of failures. Benefits of NDE, Dr.Rao said, are safe and uninterrupted operation, prevention of accidents, avoidance of unplanned shutdowns and taking decision on repair, upgradation, modernization and replacement of components for overall life extension. More than 50 NDE techniques based on physical principles and every form of energy – like magnetic particle, flux leakage, liquid penetrant, visual, optical and laser analysis, infrared thermography, radiography, eddy current and ultrasound testing, acoustic emission testing etc- are available today. NDE enables detection and location of flaws such as fatigue cracks, brittle cracks due to stress corrosion cracking or environmental stress cracking etc. it averts catastrophic failures of components ensuring safety, plant availability and profit. Dr. P. Parameswaran, Programme Leader, Structure-Property Correlations, MSSCD, Physical Metallurgy Group, IGCAR, spoke on Mettallography & Micromechanisms. He said that failures of microstructure of materials, as they change due to their components – atoms, ions and molecules built-in well defined, structural arrangements in space, had to be studied. Early failure of components occurs due to unexpected service load, defect from processing, local changes in the composition during high temperature service, varied microstructure-changes in properties, welded joints, elevated temperatures, stress and corrosive media. This often results in catastrophic and unsafe incidents. Therefore understanding the micro-structural degradation has become essential and systematic structure-property correlations are carried out on chosen materials for engineering applications. He explained in detail the possible hazards from changes in micro-mechanisms and the preventive steps that can be taken in power plants. Dr. V. S. Srinivasan, Mechanical Metallurgy Division, IGCAR made a presentation on High Temperature Failure Modes with specific reference to Prototype Fast Breeder Reactor (PFBR) and factors like Creep and Life Prediction, Fatigue, Creep-Fatigue Interaction, High Temperature Fracture Mechanics, and Atomistic Simulations of Mechanical Behavior. Dr, Bhowmik , Head Research & Projects, Amrita College of Engineering welcomed the gathering and Prof. Subba Rao, Chairman, Department of Chemical Engineering proposed the vote of thanks.